New Zealand is now one of emerging leading destinations to Study Abroad. This page will give you the required information for a prospective student planning to Study in New Zealand. India is one of New Zealand’s key export education markets. Education is a key sector that helps create the people to people links that support good relations. New Zealand provides quality education in a safe and welcoming environment with a range of lifestyle and recreation options for students. The focus of our education system on excellence, creativity and innovation and nurturing work-ready graduates is something that Indian families value. 2015: 22% increase year to date in total student visas issued to Indian nationals. All New Zealand universities are government owned and funded. 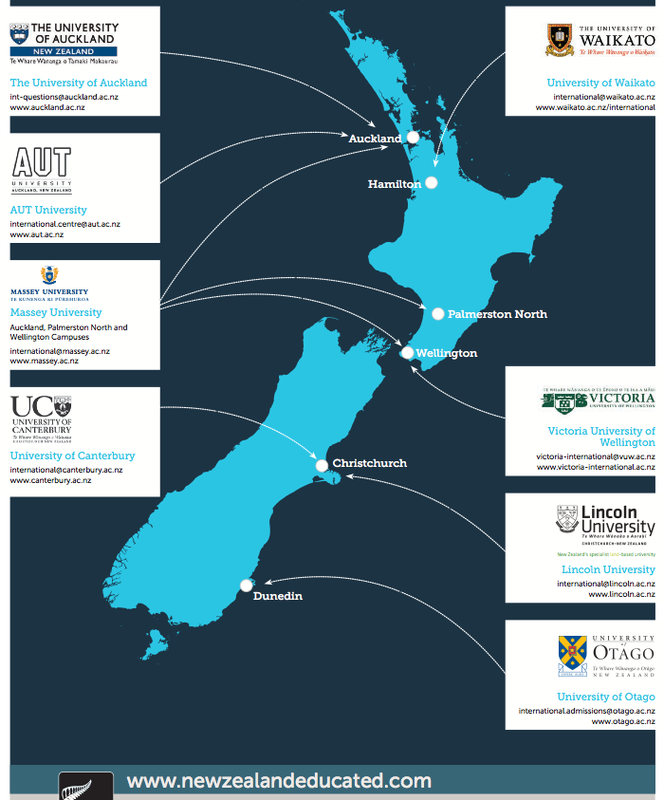 Here is a map of New Zealand University and its Locations. There are 20 Institutes of Technology and Polytechnics (ITPs). Courses are based on practical experience. Degree from ITP’s are equivalent to degrees from Universities. You can earn credits for attending courses in ITP’s that can be applied towards a degree or Diploma. There are two semesters in one academic year in New Zealand. Semester 2: July to November. Taking courses in Summer School will help the total time to graduate form your degree. Summer in USA: June to August. In southern Hemisphere, Summer is in the between November and February. Following chart provides a cost comparison between India and New Zealand. Universities accept IELTS Academic or IELTS. Check with the university for exact admission requirements. Student can work part time and full time and eligible for Work Authorization after graduation. Work permit will let graduates search for a job in New Zealand. After receiving a job offer, work permit will be extended to the length of their job offer. Partners of students (like spouse) can also apply for work permit, which is valid for duration of the course. Unlike in USA, F2 visa holders (dependents of F1 student visa) who are not allowed to work. New Zealand is one of the top immigrant friendly countries ( including Australia, Canada). Green Card in USA can take as 5 to 15 years after Employer starts the process. Employer could start the process even 5 years into your Maximum 6 years H1B Visa allowed limit. Not to mention the H1B Visa Lottery.